BSP continues to work on getting the funds together to make their fourth feature-length film . The budget is set at $60,000. 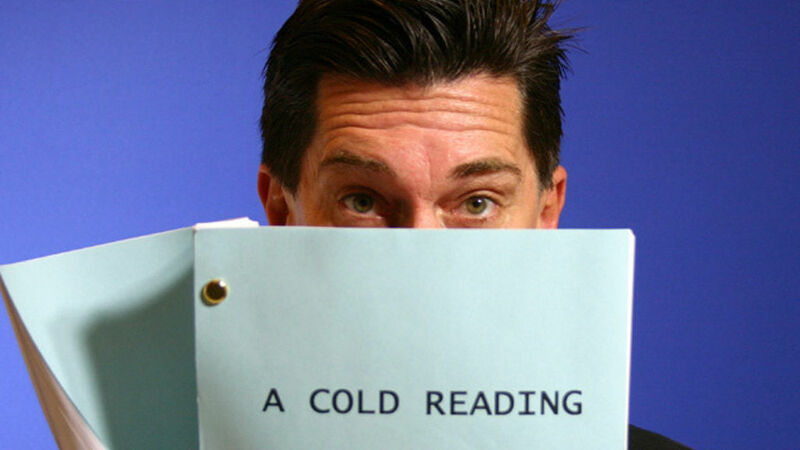 If you would like to help finance A Cold Reading you can make a donation through PayPal. Unfortunately, donations are NOT tax deductible, but you will receive screen credit. Click on the photo of Matthew Martin below to see the "begging" video we posted on Kickstarter. We imagined ourselves going door to door asking people to contribute money so we could make a movie and wondered what would happen if we went to the wrong door. The film clips are from Alfred Hitchcock's 1934 version of The Man Who Knew Too Much, which is in the public domain. "The play's the thing!" Alas, Mr. Shakespeare -- if only all the actors were aware of the script on hand. Wesley's two oldest and dearest friends, Tony and Brynn, lie dying in the hospital. That all paths lead to Death's door is hardly any great mystery . . . and yet a little explaining would seem to be in order given the suddenly crowded welcome mat. Later than most, Tony had just met the love of his life, a handsome young Cuban, while Wesley's friend-roommate-patroness Brynn had just revitalized herself with her own heartfelt compassion: She has rescued a troubled derelict still tentatively reestablishing communications with the world -- by resorting to a most unexpected device -- after having suffered a traumatic end to his professional acting career. Drawn to the one friend's bliss and repelled by the other's apparently blissful gullibility, and having already been forced into an early retirement by a wrecked economy, Wesley explains to himself how he found himself pushed to the limit as his friends found new lives. It is a tale told not by an idiot, but by a player surprised at the cunning of his own lines as much as by any twist of fate.